In November, we got our first Roku box, signed up with Netflix, and I did a four part series on Netflix, Roku, and cutting cable. At the time, I re-assessed how much cutting cable would save us. This time, I came up with a figure closer to $50 a month. This meant that cutting cable would save us $600 a year. It was highly tempting, but the online options just didn’t seem *quite* there at the time. A year later, in October of 2010, I wrote a follow up about cutting cable. In this post, I pointed out how we weren’t paying for DVD video rentals anymore except (at the time) through Netflix. Instead, we were borrowing DVDs from our local library for free. (Ok, there are taxes we pay that pay for this, but we’d pay those taxes whether we used the service or not. We can’t exactly opt out of paying taxes.) Again, I felt that we were close to cutting, but not quite there. Since then, the situation has evolved. First, Netflix raised their prices and separated out their DVD and streaming offerings. We made what seemed to be a tough call: We cancelled our Netflix DVD service. In the end, it was great getting all of those DVDs, but they would often sit unwatched for weeks. Meanwhile, Netflix streaming was getting more and more use. Next, we signed up for Amazon Prime. This was initially to help defray shipping costs if we bought items from Amazon, but it also meant that we got many Amazon Video on Demand movies/TV shows for free. In addition, Netflix and Amazon have gone on a streaming licensing spree in the past two years. More and more items have come onto streaming. In fact, it has gotten to the point that my boys barely ever switch over to live TV. They are content to watch Netflix streaming shows all day, every day. On the purchased DVD front, I figured out how to stream my DVDs within my house. This means that we don’t have to root through the DVD cabinet, load the disc, and then put it back when done. Instead, we can select the movie/TV show from an easy to navigate menu and hit play. This will mean that we will be more likely to buy DVDs since the boys can play them themselves on a whim instead of asking us for help finding/loading them. Also, as my boys have grown, their entertainment tastes have changed. Instead of just sitting and watching TV, they will love playing on the computer, playing on their Nintendo DS systems, playing with Legos, or playing on the iPad. NHL has even discovered books and will spend hours looking through the various books he has. All of these cut down on TV time. In fact, using our DVR as a guide, we only really watch about 19 shows now. Those can all be viewed either from an over-the-air broadcast, Netflix, Amazon VOD, or the network’s website. Finally, cable TV prices have gone up. Last year, we were ready to quit, but got a great deal from our cable company. Since that deal was about to expire, I called up to see what they could do for us. The "deal" we were given was that we would pay more money and get slower Internet. When I asked about keeping our "standard speed" Internet, I was given a quote for a LOT more money than what we’re paying now. At this point, cutting cable would save us nearly $65 a month. That’s almost $780 every year that we could put into other needed areas (or even *gasp* save). Given that we have been using cable less and less, that cable is getting more and more expensive, and that all of the TV shows we like watching are available elsewhere, I’d say we’re closer than ever to cutting the cable cord. Right now, I’d wager that actually cutting the cable cord will be tougher than living without cable TV will be. Have you cut your cable cord or called your cable company to request a lower rate? 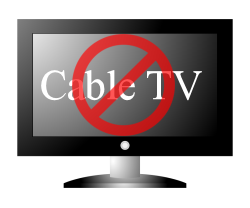 NOTE: The "No Cable TV" image above was made by combining HDTV by jgm104 and No-sign by skotan. Both images are available from OpenClipArt.org.